Let's see here... A random sushi restaurant that looks pretty sketchy located near a Skytrain station. Oh and it is sandwiched in between a Megabite Pizza and a Subway. 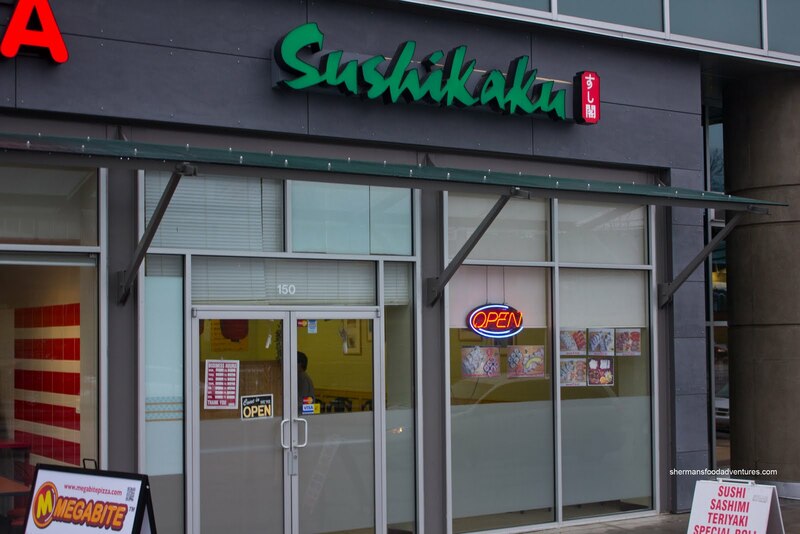 What are the chances of finding "good" sushi here? Is this a rhetorical question? Let me throw in one more thing. The Skytrain station is Production Way/SFU. Right, a mass of University students who are usually in a rush and not necessarily in search of "gourmet" food. That is why Sushi Kaku has probably survived all these years. I remember getting takeout from this place 5 years ago and it wasn't that great. I truly thought that time would finally catch up with them. Nope, 5 years later and they're still here! So while I was in a rush, it seemed like a good idea to try the place out again. 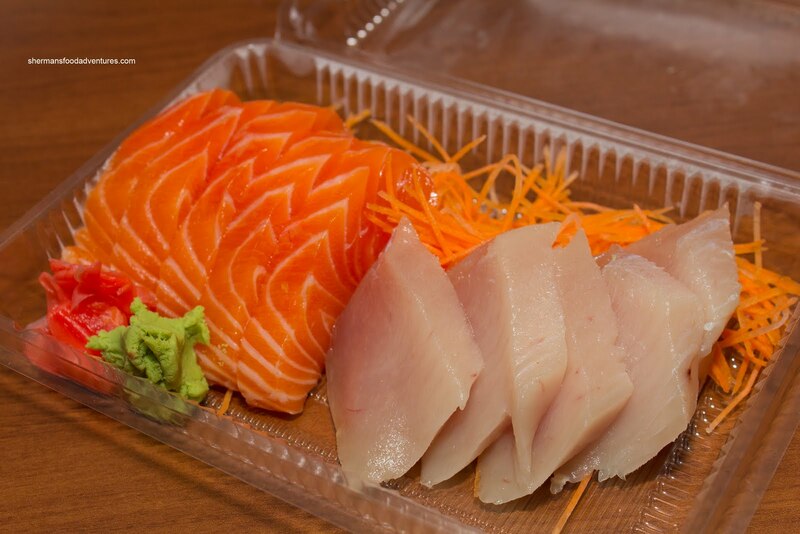 So I got a couple of things to go starting with the Salmon and Tuna Sashimi. With fairly large slices of fish, yet at the same time, not cut particularly well, this looked okay appearance-wise. It was in fact okay, specifically the salmon. It had a good texture which was neither mushy nor chewy. Tastewise, it was fine as well, with no fishiness and a touch of sweetness. As for the tuna, not so much. It was mushy (not in a good way) and it had a slight tinge of fishiness. 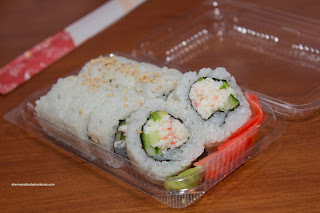 In addition to my sashimi order, I also got a combo which included a California Roll. From its appearance, the rice looked rather gummy. Taking a sample, and my suspicions were right. The rice was indeed gummy and bland. Furthermore, there was very little in the way of avocado in the roll. Pretty average maki sushi. 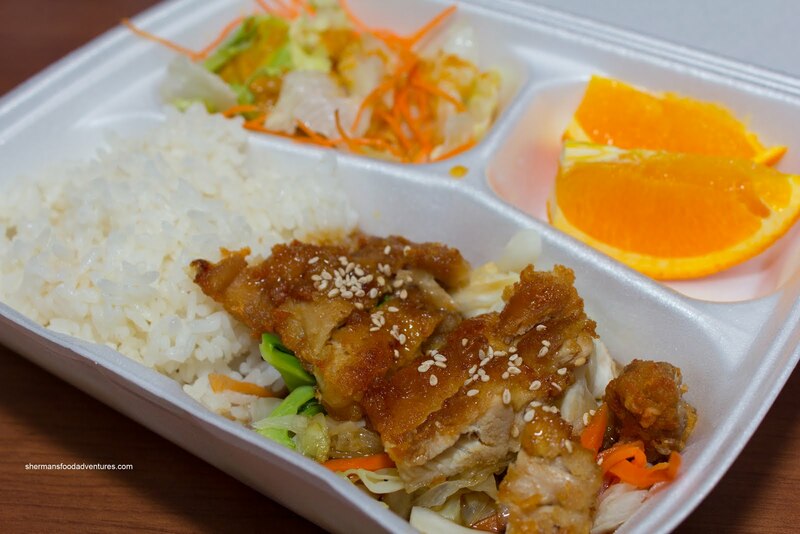 Lastly, I had Teriyaki Chicken with rice flanked by a green salad and orange slices. From just eyeballing the chicken, I could tell it was dry. Yup, it was dry. The worst part though was the sauce. It resembled a Chinese sweet sauce rather than teriyaki. This could've passed for sesame chicken. Okay, I'm gonna stop here. As you can probably guess, the food here is pretty average at best. Yet, let's get real. They are not catering to me nor anything who really wants good Japanese food. Otherwise, they wouldn't be located where they are. Hence, they have their customers and will continue to do so. Food here is very meh. I had the misfortune of eating here in December, not of my own will (had to meet a friend there). BUT since we're talking about this area, there's a burger joint (forget name) just north of Sushi Kaku on the other side of the access road where the buses enter the loop. The burgers there are AMAZING. You need to try them out, Sherman. @LR So underwhelming food eh? Yes, I know what you're talking about too. Will try it soon.